The Lady of the House Speaking: May Rudolph Day is Coming! Here's the three day warning for those of you who do not know about Rudolph Day and for those of you who know about it but may not realize that it is coming up this week! 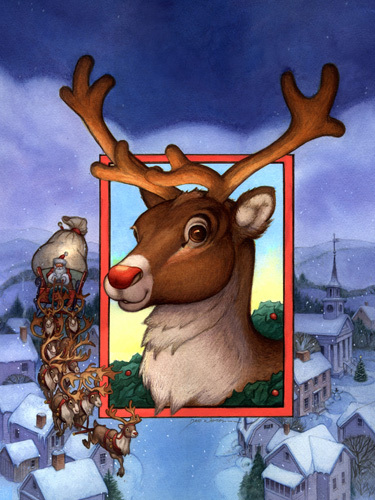 A few years ago, members of our Christmas community began to observe "Rudolph Day" on the 25th of each month. On that day, we take a few moments to plan some simple tasks for the month ahead, in order to get ready for Christmas Day with plenty of time to spare. By starting early--and working a bit at a time on each month's Rudolph Day--it's easy to prepare for Christmas, save money on gifts, and cut holiday stress. The bottom line is...prepare for Christmas by doing something every month and make the 25th of each month a Rudolph Day by doing something Christmasy! Check back on the evening of May 25th to see how I celebrated Rudolph Day.